As previously described, endodontic diagnosis is composed of two parts. A pulpal diagnosis, which indicates the status of the pulpal (nerve & connective tissue inside the tooth), and a periapical diagnosis, which indicates the status of the periapex (tissue around the end of the root). 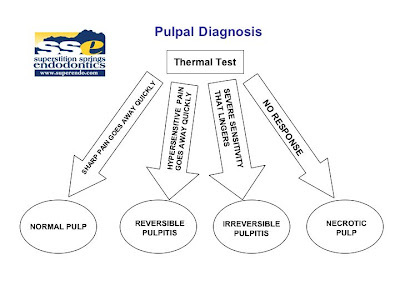 Pulpal Diagnosis can be accomplished using cold, heat or electric stimulus. Cold testing is the most reliable. 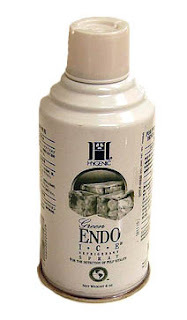 Endo Ice is the most convenient, and easy to use product for thermal testing. The following flowchart will help you with your pulpal diagnosis. 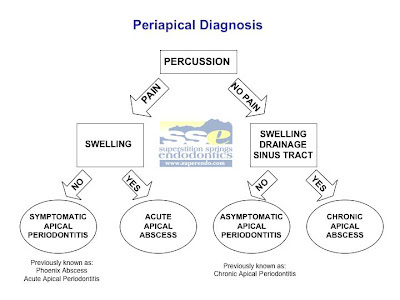 As previously discussed, the new diagnostic terminology defined by the American Board of Endodontics simplifies the periapical diagnosis based upon pain and swelling. The following flowchart can be useful in helping to understand the diagnostic terminology. Thanks for your sharing on the pulpal and periapical d(x)!! It helps me alot.. ^^ Malaysian Dental Student UKM. Excellent web site you've got here.. It's difficult to find high quality writing like yours these days.